The majority has spoken and I have chosen my new button art for Monday Maunder!! No April Foolin'!! I finished Before I Fall by Lauren Oliver this week and started A Tale of Time City by Diana Wynne Jones. The month of March was filled with such reading goodness and I hope that April brings just as wonderful, if not better stories! If I had to choose a favorite, I would say that Howl's Moving Castle by Diana Wynne Jones was the winner this month, but Cinder by Marissa Meyer would be a close second. What was your favorite read in March? I have a lot to report in blogging this week! I finished a couple of items from my Bloggiesta list that I was not able to finish last week. 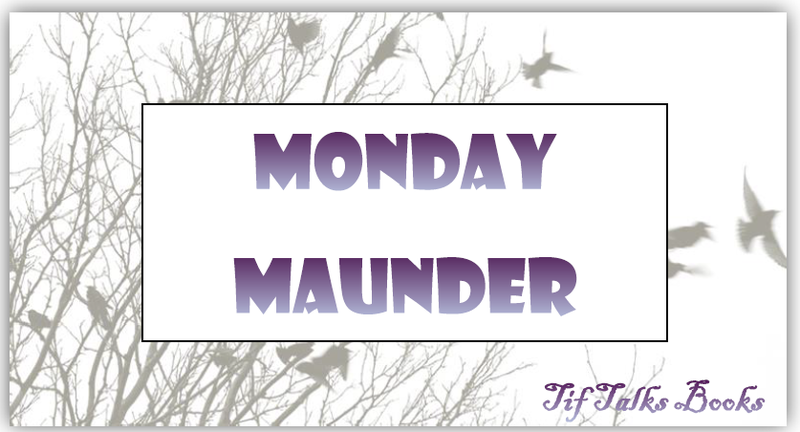 As you can see from above, I chose my new Monday Maunder button art. I also began exploring new feed readers with Feedly and Bloglovin. I am leaning towards Feedly simply because of the phone app, but I am going to continue to explore for a bit before making my final decision. I also signed up for Google Authorship thanks to information from Tasha of Truth, Beauty, Freedom, and Books. I also worked on some items for the upcoming Armchair BEA event as well as my newest project with Becca from Lost in Books and Tasha from Truth, Beauty, Freedom, and Books that launched today, Book Bloggers International. Be sure you are following both of these!! What did you accomplish this week on your blog? What are some must-see items or sites? One of my favorite pieces that I have written in a long time appeared this last week over at We Be Reading - The Magic of Diana Wynne Jones. DWJ's Howl's Moving Castle really struck a nerve with my real life and has left quite an impression on me. Please click on over and let me know what you think! What books have left a lasting impression on you recently and why? Last, but definitely not least, my house finally went on the market last week; Thursday to be exact. The signs were posted by mid-morning and by the afternoon, we had three showings scheduled! The rest of the weekend was quiet, which led to some very much needed relaxation! Then, we had another showing today. Now, we wait ... and make sure I have a clean house all. the. time! Thanks for the info on Google Authorship, I need to do that. good to see you member of BBI! wordsandpeace.com ... Just checked out your post and commented!! Holler if you are interested in being a featured blogger of BBI! We would love to have you!! Topcho ... I recently heard that GR is going to be incorporated into Google+, but I have yet to see it show up. I am going to miss it too! Just saying hi before your next maunder tomorrow. Since switching from GR, I just don't keep up as well with the blogs as I should. I need to figure out why so that I don't miss out on the fun! Favorite book in March? Hmmm...it's a toss up between Feed (Newsflesh Trilogy #1) by Mira Grant and Twice Tempted (Night Prince Trilogy Book 2) by Jeaniene Frost. And yes, these are audio books. Can't seem to actually read a book nowadays. Amateur Novelist ... I LOVE the Newsflesh Trilogy!!!! I think it gets better and better, so you have to keep reading!! Still haven't read anything by Frost though. One of these days . . .